ooking at the title of this pokie from IGT, people could be forgiven for expecting a game based on royalty, maybe an ancient emperor or European King. But no, this game is all about butterflies, specifically the Monarch butterfly which flaps its yellow and black wings all over the 5 reels and 25 paylines that it features. Flowers, caterpillars and playing card symbols join the butterfly, while players will benefit from some extra treats like stacked wild symbols, bonus payouts and a free spins game that should all help to add variety to the normal run of play. IGT are one of the longest established companies in the casino games development business, so it’s only natural to expect that their pokies are well thought out and come with all the features that players are likely to want. Grand Monarch might not be packed with features, but it looks good and plays well, which is really what most people are after. The design is certainly a highlight, with a nice woodland scene above the reels, complete with a carpet of white flowers and trees peeking through the mist. Underneath the main game is a series of control buttons that gives a huge bet range from just 0.01 to 500.00, although clearly the minimum stake will only activate 1 of the 25 paylines and on average, 24 out of 25 winning combinations won’t count, so most people will choose to have all of the game in play, which equals a minimum stake of 0.25. Those wins come from seeing 3 or more identical symbols land across an active line, on connected reels running from the left side. Like many pokies, Grand Monarch has the standard playing card symbols 9, 10, J, Q, K and A to create the lower value wins, but these are also likely to be the most frequently seen ones. The 9 through to Q are each worth 5, 25 or 100x the line bet when they land on 3, 4 or 5 reels, with the K and A worth a little more and the picture symbols paying out the biggest wins. The blue and white flower symbols each pay 25, 75 or 250x the line bet, with purple and pink flowers paying up to 500x, but the beautiful butterfly pays the most and comes with some special attributes of its own. Landing the monarch butterfly across 3, 4 or 5 reels on a line will be worth a prize equal to 50, 250 or 1000x the line bet respectively. But as this is also a wild symbol, it can help to complete winning combinations by substituting for all the standard symbols. It won’t be able to substitute for the caterpillar symbol though, as this triggers the free spins bonus game when it turns up in any 3 positions on the middle reels 2, 3 and 4, and although only 5 spins are initially awarded, there’s more caterpillars crawling across the reels to boost the chances of retriggering them. There’s also extra wild butterflies packed into the game during the free spins, so it’s easier to collect a few wins, but while it’s theoretically possible to trigger the round over and over again, to a maximum of 255 spins, it’s a pretty unlikely scenario. Before the free games begin, the caterpillar will award 3x the total bet per spin, so even if there’s no winning spins through them, players will at least have won something from the bonus symbol. 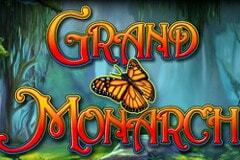 Grand Monarch is a comparatively old pokie, and while it may have been state of the art on release, others have caught up and overtaken it. However, it remains a lovely-looking thing and players who like wildlife and brightly coloured flowers will be drawn to this one like a moth to a flame, although hopefully without getting burnt as a consequence. Coming from IGT, it will have a reliable return to player ratio, so even without the bonus round being triggered, players should still be able to spin these reels for little outlay. The bonus features can be quite rewarding though, especially when the wild butterfly turns up to complete lines of symbols, although in many newer pokies the resulting prize would be doubled or more, but we can’t have everything. The free spins game, while potentially lucrative, is also something of a let-down, simply for the fact that only 5 spins are awarded, and while it’s possible to get more added on with more bonus symbols appearing, this low number is the fly in the ointment of the Grand Monarch pokie.